Back in the olden days, you could use whatever programming language you wanted to write your client-side code: ASM, C, C++, BASIC, Java, C#, etc. Hell, every language had a client-side UI framework attached (often more than one). Then the web hit and we used those same languages to generate HTML on the server-side. It was a polyglot world for client-side development right up until mobile made itself the #1 targeted format in the world (cue record scratching noise). This talk blew my mind. This was the browser-based full stack for .NET that I hadn’t even realized that I’d wanted. 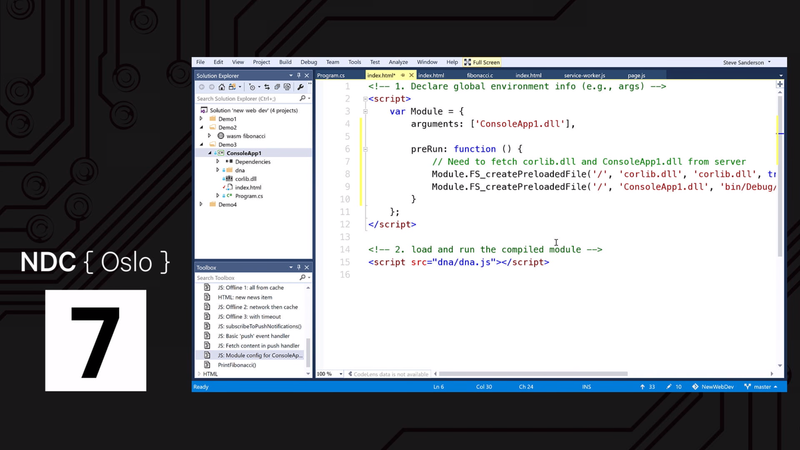 Steve’s demo made me realize that not only could Microsoft create an amazing end-to-end experience for .NET developers that wanted their code to fit into the modern web, but they could do it in a way that worked across all form factors and all platforms. This demo wasn’t the end. 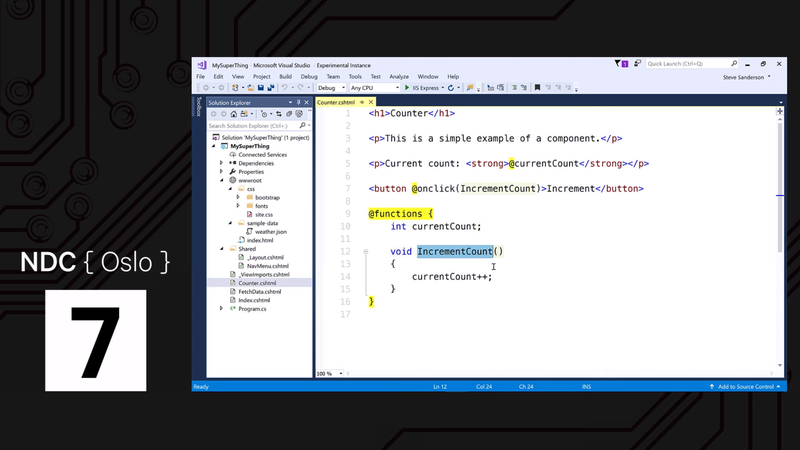 Steve recently posted an update talking about all of the contributors he’s had since his demo, but also the move to the more full-featured Mono .NET implementation provided by Xamarin. Reified classes: Silverlight did this thing were you could send .NET objects over the wire and use the same class implementation on both sides. Steve’s already shown how this can be done over the web using JSON and REST, which means that any language can play on either side. Do this with GraphQL and you’ll get querying only what you need and data change notifications via subscriptions. And as huge as this will be for the .NET community (can you say “Silverlight without the mess”? ), that’s not all. Right now, Steve’s proof of concept .NET Runtime is a 4MB download for any .NET app. That’s clearly not going to work. As Steve mentions, there are lots of optimizations to do that’ll bring down the size, but the real optimization win is going to be when the next version of WebAssembly comes out, including two big features: plugging into the browser’s VM and access to the DOM. The WebAssembly working group are already discussing both of these (e.g. here’re the notes from a recent meeting discussing garbage collection). With access to the browser’s VM, a .NET app won’t need to ship it’s own runtime for every app — it’ll just plug .NET objects into the one provided by the browser. Now the .NET runtime for the browser can be trimmed to a bridge to what the browser provides as well as the .NET Framework base libraries. Combine that with “tree shaking” (removing the IL your code never uses), code splitting and on-demand loading and you’ve got a .NET WebAssembly app that even anyone on just their phone can love. But even if it doesn’t get that far, Steve has shown us that WebAssembly enables an amazing client-side experience. I can’t wait to get my hands on it.